Measuring and understanding changes in the chemical composition of the global atmosphere, particularly related to ozone-depleting substances, greenhouse gases, and hazardous air pollutants; identifying the role of natural and human-related influences on hemispheric to global-scale atmospheric composition; diagnosing variability in the atmosphere's oxidizing capacity, in terrestrial photosynthesis, and in stratosphere-troposhere exchange; quantifying fluxes of trace gases from the United States; and effectively communicating scientific results to interested parties, nationally and internationally, including the public and policy makers. Interpreting observations from a multi-decadal sampling program for over 30 trace gases at 45 sites distributed throughout the global atmosphere is a continuing theme. Data obtained from measurements of these samples via high-precision gas chromatography coupled to mass spectrometry have been used recently for identifying an increase in emissions of CFC-11, an ozone-depleting substance banned by the Montreal Protocol in 2010. This renewed emission increase may suggest delays in ozone recovery as a result of a country or country not adhering to this international agreement. 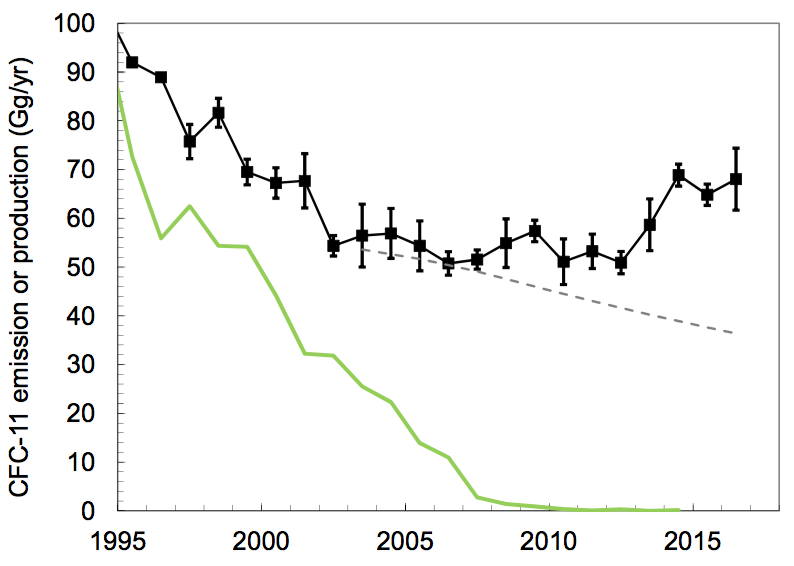 These data have also been used in recent studies for 1) investigating the influence on the ozone layer of increasing concentrations of short-lived gases not controlled by the Montreal Protocol (e.g., dichloromethane), 2) diagnosing the global and relative hemispheric concentration of the hydroxyl radical over time and estimating the impact of those changes on the global budget of methane, and 3) improving our understanding of regional and global budgets of carbonyl sulfide, which may enhance our understanding of CO2 uptake by terrestrial photosynthesis. In addition to studying atmospheric changes on global scales, the U.S.-centric sampling program managed by the Carbon Cycle Group and NOAA has allowed investigations into national-scale issues. Data obtained from this regional network have been used to quantify national-scale emissions of ozone-depleting substances and non-CO2 greenhouse gases that show how the Montreal Protocol has substantially added to the reduction in U.S. total greenhouse gas emissions in recent years. These data have also been used to improve the quantification and attribution of atmospheric impacts associated with oil and gas exploration and development (including hydraulic fracturing) and enhance our understanding of continental-scale sources and sinks of carbonyl sulfide, a trace gas whose concentration changes over land to appear closely linked to terrestrial photosynthesis.